If you congratulated yourself for buying a home after the housing bubble burst, but now are having trouble selling it, the answer is probably in the price. 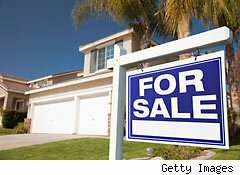 Current sellers who bought their homes in 2007 or later have overpriced their homes by more than 14%, according to an analysis of listings by Zillow.com. The analysis also found that buyers who purchased a home before 2002, have their homes priced 11.6% over market value. Buyers who bought between 2002 and 2006 have their homes listed 9.3% above current values. "Post-bubble buyers seem to believe they escaped the worst of the housing recession, as evidenced by how they price their homes today," said Zillow chief economist Stan Humphries. "But 2006 was just the beginning of the housing recession, and it is continuing in earnest to this day. That means that even people who bought after the bubble burst need to break out the pencil and paper and do serious research into what has happened in their market since they first bought their home, whether it was four years ago or six months ago." Overpriced inventory is contributing to the stagnant housing market. Sales of previously owned U.S. homes hit a six-month low in May. "When you see so much inventory, the problem is in the price," Ko Wang, director of the real estate program at Baruch College, told DailyFinance. "You can sell any property, as long as you have a price."